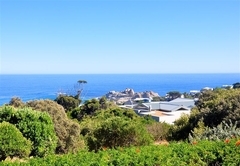 Petit Paradis is a highly recommended property providing self catering in Llandudno for up to 2 guests visiting the Atlantic Seaboard region. 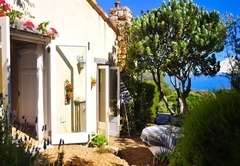 Petit Paradis is a beautiful French Provencal stone cottage set in a private, indigenous garden overlooking Llandudno beach. 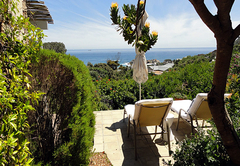 The 1-bedroom cottage is ideal for a couple and offers spectacular ocean and mountain views. 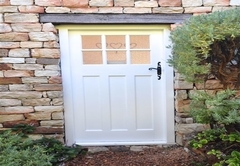 The cottage was lovingly built with exceptional attention to detail, including stone floors, under-floor heating, high beamed ceilings, antique light fittings, French wrought iron work and wooden shutters. 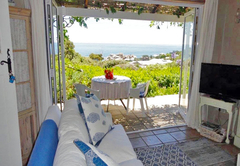 Petit Paradis comprises a double bedroom with French doors leading onto private gravel patio with sea and mountain views and breakfast table shaded by tall proteas, bathroom with bath and shower tiled in travertine (also with mountain views), lounge with kitchenette and covered “sundowner” patio with magnificent sea views. The lounge is equipped with television and a gas fire place for cosy winter evenings. The kitchenette is fully equipped with fridge, convection microwave, hot plates, washing machine, kettle, toaster, coffee machine, etc. There is a stone table and chairs on the patio where you can sip your cocktails at sunset as well as loungers to soak up the afternoon sun while overlooking the ocean. 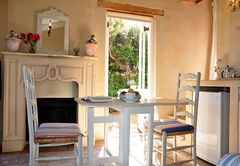 The beautifully furnished bedroom comprises a queen-sized bed with down duvet, French antique linen and cotton quilt. The Victorian roll-top bath has wonderful mountain and garden views through sash windows. 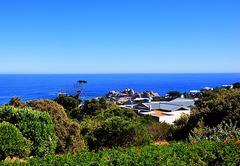 Fluffy white bath towels as well as beach towels and umbrella are provided. 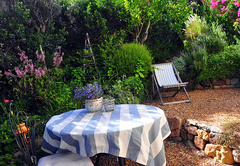 The cottage is surrounded by a beautiful garden planted with indigenous plants as well as an assortment of cooking herbs, which you are encouraged to use. 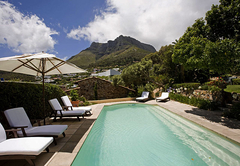 Guests are welcome to make use of the large swimming pool and pool loungers located next to the cottage. 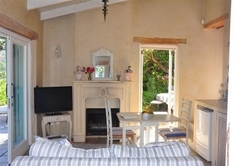 We also have access to squash and tennis courts as well as a yoga school located 300m from the cottage. The beach is +/- 5min walk away. 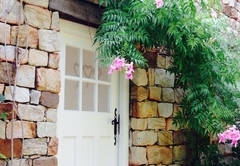 This is a non-smoking cottage ~ smoking allowed on patios only. 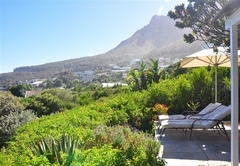 Petit Paradis comprises a double bedroom with French doors leading onto private gravel patio with sea and mountain views and breakfast table shaded by tall proteas, bathroom with bath and shower tiled in travertine (also with mountain views), lounge with kitchenette and covered “sundowner” patio with magnificent sea views. The lounge is equipped with television and a gas fire place for cosy winter evenings. 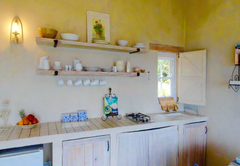 The kitchenette is fully equipped with fridge, convection microwave, hot plates, washing machine, kettle, toaster, coffee machine, etc. There is a stone table and chairs on the patio where you can sip your cocktails at sunset as well as loungers to soak up the afternoon sun while overlooking the ocean. 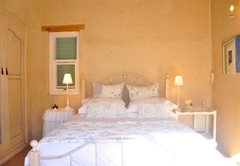 The beautifully furnished bedroom comprises a queen-sized bed with down duvet, French antique linen and cotton quilt. 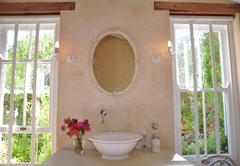 The Victorian roll-top bath has wonderful mountain and garden views through sash windows. 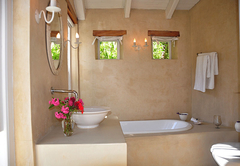 Fluffy white bath towels as well as beach towels and umbrella are provided. Loved every minute of our seven day stay. Thanks to our host for nice winter specials of places to go for meals. Thanks for the great wine and treats left for our enjoyment. We saw whales, lots of birds, the view is stunning. The coziest cottage, with comfy beds. We went in winter time and we were warm and toasty, nice underfloor heating and a fireplace. 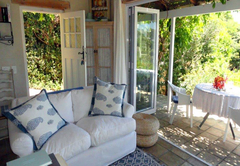 We enjoyed every minute in this beautiful cottage.Having breakfast on the terrace, surrounded by the beautiful plants, sleeping in the comfy bed, gazing at the stars at night- everything was perfect!